The 3rd round of the Belgian SCT Cup was hosted by the Belgium Power Team based in Merchtem. The club is a regular host of the Cup and always good for a great time. This year the track had been changed to a more technical layout with a pretty challenging and big off-camber turn. 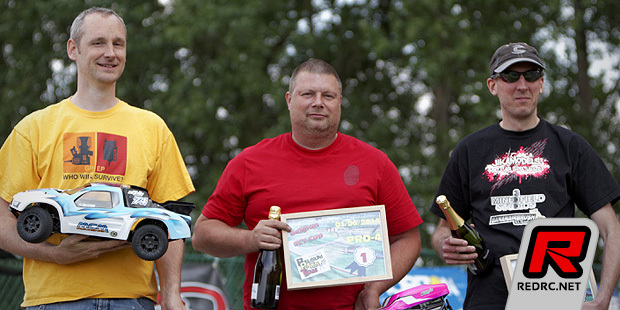 Philippe Hautecoeur (Team Associated) kept the momentum of his overall win in previous race and took the first Pro2 qualifier with a 3 seconds margin on Nicolas Evens (TLR). Julian André in 3rd is struggled with his car on the astroturf surface. 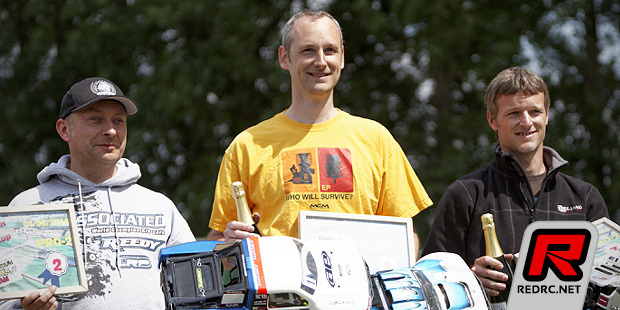 The second leg saw Nicolas posting the fastest time ahead of Philippe and Edouard-Benoît Michez (Team Associated). Philippe then went on to take the final leg to take the overall TQ spot, ahead of Nicolas and Julian. Thierry Matthieu (Tekno) dominated the Pro4 qualification once again. 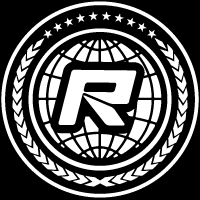 Nicolas Evens (TLR) followed in front of Philip De Keersmaecker (Tekno ). Starting from 2nd place on the grid of the Pro2 finals, Nicolas Evens secured the overall win by taking the first two legs, ahead of Philippe Hautecoeur. The battle for 3rd spot was on between Tom Pierard (TLR) and Edouard-Benoît Michez who started into the final leg tie on points. In the end Tom grabbed the final podium spot with a 2nd place finish. In Pro4, Thierry Mathieu felt very comfortable and quick and so he was able to win all the legs. Nicolas Evens follows with two 2nd place finished while Philip De Keersmaecker completed the podium in 3rd.